FORGET Valentine Holmes. Move over Andrew Fifita and Chad Townsend. 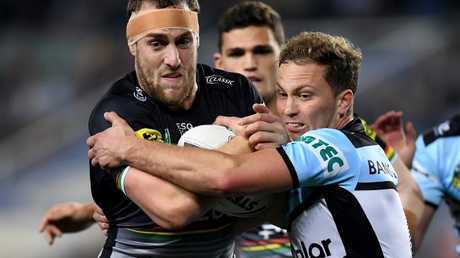 The Sharks' lethal weapon is undoubtedly Matt Moylan, according to former Cronulla premiership-winner Michael Ennis. 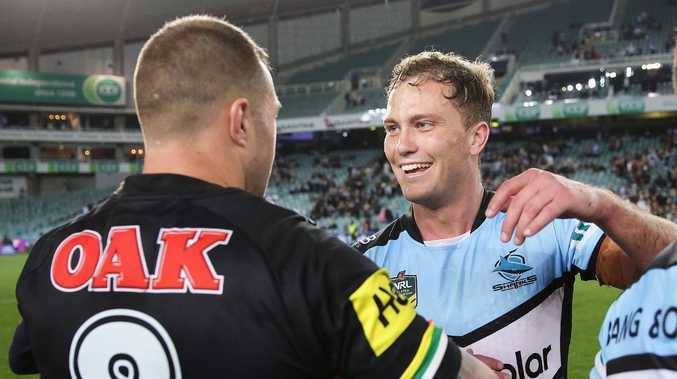 So good has their new five-eighth been throughout the season and again last Friday night, that Ennis says Moylan is carrying the club's title aspirations squarely on his shoulders. "He has been outstanding. He was again terrific the other night on the big stage and he delivered," Ennis said. "Up against his former side that walked him out the door 12 months ago he came back to bite them on the you know what and delivered some miraculous plays. "He had a one-on-one tackle in the first half that was crucial and then to be able to deliver that ball for Luke Lewis when he went tearing away to score. He was just superb. "He's now got the Cronulla Sharks in with a shot at playing in a grand final." That one-on-one tackle of Moylan's was on Panthers backrower Isaah Yeo in the early stages of their semi-final. The ball-and-all stop right on his own try-line prevented Penrith from gaining the ascendancy. Matt Moylan muscles up against Isaah Yeo. AAP Image/Dan Himbrechts. Speaking about that try-saver, Ennis was gushing in his praise of the 27-year-old's robust defence in 2018. 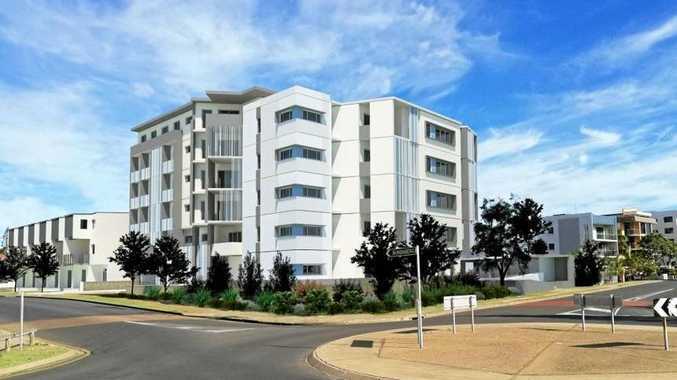 "He's been by far and away Cronulla's most attacking weapon this year," he continued. "He's had endless try-assists upwards of around 18, I think. So he's been super creative. But it's been his first season really defending in the frontline for the majority of the year and he's been outstanding." He joked the Sharks should host Panthers supremo Phil Gould at the preliminary final in Melbourne as thanks for gifting them the prodigious Penrith junior. "Three from three this year against the Panthers. Maybe they should take Gus and sit him down at AAMI Park this week, sit him in the stands or on the Cronulla bench," he said.